Unique, personalized notepads for the musician! Musical notes throughout the name and black and white instrument sketch make this notepad set the perfect gift for the music teacher or musician in your life! Each notepad is white, 75 pages, and measures 8 1/2 x 5 1/2 inches. 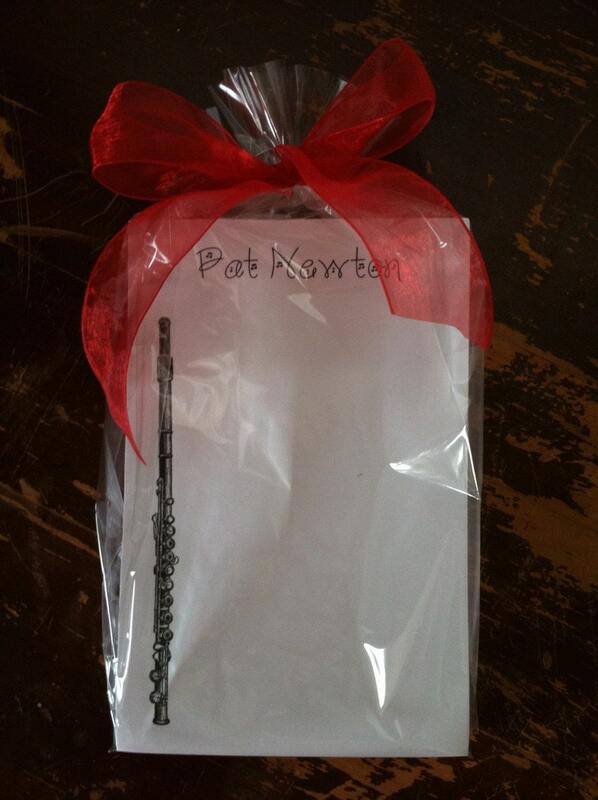 Each 2-notepad set arrives in a cellophane bag with a colorful bow ready for gift giving. The layout varies depending on the instrument and name and how they look best on the paper. If you have a strong preference for name at top or bottom, just let me know that too! Convo me if you have a special idea or request! This was awesome. My niece loved it and uses it all the time. Quick shipping! Beautiful note pad. Excited to give my daughter for Christmas. Perfect! Just what I wanted. I accept credit cards, PayPal, checks, and money orders. If you are not satisfied and/or need to return your item, please contact me. If the error is mine, I will send a replacement immediately at no charge. If the error is yours, I can usually send a replacement at half price. Although most of my items are personalized, I will accept returns for a refund if you are not satisfied. I ship by first class mail, generally within 1 day of receiving your order, provided you have given me all of the necessary details such as color, font, letters, etc. If you need a rush order please contact me to upgrade the shipping. Prioirty Mail is an additional $5 on most orders and Express Mail is an additional $25. UPS shipping is available as well.